This unique private retreat is nestled in the woods next to a stream. The views from the 25' floor-to-ceiling glass walls look over the extensive natural gardens and patios. The 900 square foot master suite has a king bed, interior balcony, exterior balcony, fireplace, jetted soaking tub, and steam shower. The remaining four bedrooms have queen beds. The house is fully equipped including a grand piano, new luxurious linens and beautifully appointed leather furniture. A dramatic floor-ceiling cut rock fireplace in the living room is available for cozy evenings. The dining area has a long table that can seat 12. The house is very comfortable with lots of space and privacy. It is great for families or friends that want to enjoy a wonderful holiday together. The great room and patios are easily converted for large functions and gatherings, easily seating 40 to 70 (depending on the season contact the owner for info) for your event. There are additional charges for events depending on the event and the number of people. Sometimes we offer weather guarantees. For winter, usually it involves a combination of the weather and lift operations. Ask the owner for details. Ed has over 20 years of experience creating, financing, advising and managing start-ups in a diverse set of industries including land use planning, commercial real estate investment, the music industry and hi-tech. Truly a jack of all trades, his accomplishments range from pioneering GIS applications in ecology to innovations in contemporary architecture. Ed brings a particular knack and fondness for early adoption of emerging technology to every project he starts, and his innovations have received international recognition including an award from Netexplo in 2012 for his work at H2020. He is simultaneously well versed in resolving field trial glitches and smoothing adverse policy conditions. Ed has a Bachelor of Science degree in Biology and Environmental Studies from St. Lawrence University and achieved NCAA All-American status in skiing in addition to his studies. Ed is an avid sailor and lives with his wife, and two children in the Berkeley Marina. Erika is an entrepreneur, attorney and consultant originally from Tahoe City, California. She provides strategic counsel to clients across a range of industries, including climate change, California cap-and-trade, sustainable fisheries, micro-finance and micro-agriculture. Erika is serving as the CEO for Renewable Exploration/H2020, which was an early-mover in crowdsourcing information about water resources, including watershed management and water poverty. She has been internationally recognized, including receiving the 2012 Netexplo Award, for this work in tapping the “intelligence of crowds” to improve public understanding of water resources. She speaks frequently on the subject at national and international forums such as UNESCO. Erika has worked extensively in the areas of climate change, land use and water management. She graduated with honors from Cornell Law School and has dual degrees in Earth, Atmospheric and Planetary Science and Music from MIT. Designed specifically for entertaining, our property has fast and easy access to the lifts and local amenities while allowing exceptional privacy in a natural setting. place settings for at least 20.
huge and well stocked with appliances, pots pans etc. Easy access to River Run lifts. XC ski skate for free on the groomed community trails across the street. 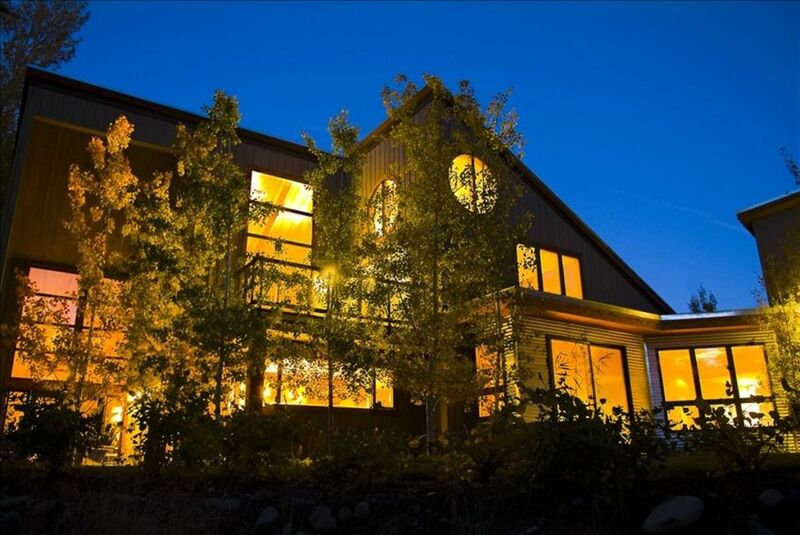 Private trout stream (seasonal), walk to world class fly fishing, bike path, walk to groomed cross country ski trails, 10 minutes to ski lifts. 5 well traveled ski buddies stayed at Edwin’s for the week. Loved the house. It’s large and equipped with everything and anything you want! If you’re looking for a Marriott this is not your house. If you’re looking for a large house and don’t mind a “lived in a bit” look this is your spot. Fantastic value. If we return to Sun Valley this is where we will stay! The home was clean and in a very convenient location for skiing. Edwin was very helpful in making our stay convenient and enjoyable. Would definitely recommend especially for the price. Enjoyed our stay here. Very spacious and comfortable home. I'm really surprised that this property has great reviews. I've rented with VRBO several times and I've always been happy with my experience and the accommodations. Our stay at this property was much different. The owner/property manager really made us feel uncomfortable as if we were being watched and we were going to get into trouble for anything we did. He met us at the property and went over a long lists of things, he stayed for over an hour and said he would come back by tomorrow... we were staying two nights. Prior to coming I asked about parking small trailers at the property as we wanted to bring up bikes, but this was an additional charge. We decided the charge was too steep so we found other accommodations. When we brought our trailer to drop off the bikes he told us the problem was actually bringing the trailer to the property because it would cause damage to the property. The property is listed to accommodate 16 guest but after 7 guests it's an additional charge, this includes small children and babies as he suggests babies have even more wear and tear on a property. I guess that makes sense but I've never heard of such a thing. He told us the cleaners would likely be by the house the day we checked out around 9:30 to start on the laundry, checkout is 11:00. The list of cleaning for check out was ridiculous when you are paying a large cleaning fee for a house that really isn't very clean in the first place. The house itself is decent, it's just rundown and needs a deep cleaning. The bedding was clean and the beds were comfortable which is a big positive although one of the beds was broken and bowed in the center. The hot tub was slimy, he turned the temperature to 95 which felt like luke warm bath water. If your not desperate for a place, I would look elsewhere. A few from Shayla's group of young friends expressed their happiness but upon reflection this review isn't that surprising to me. I think Shayla has some complaints that are not legitimate but I do take cleanliness of my home quite seriously. The RV, group size, and cleaning charge /procedures are spelled out in the single page rental agreement Shayla signed/agreed to at booking. I do charge a little more for large groups. The charges are calculated automatically by VRBO/Homeaway for adults and children. Shayla's group size grew from 8 to 16 (at least) by the time she arrived. I did make it clear that omitting kids from the count wasn't acceptable. During Shayla's visit I was staying in my other vacation house next door while visiting town on my own summer vacation. I was aware of the RV's presence as it drove by my residence and parked. I don't recall it being a big issue to resolve but do remember Shayla made clear that my policy was foolish and should be disregarded. Normally I charge extra for RV hosting to offset the associated costs I do not wish to subsidize. These costs include the damage (on average) to landscaping caused by tires and bumpers and tall roofs. I did not charge her for the RV's. Shayla's friends did take the bikes from it before politely removing the RV. The water in the hot tub had been changed just prior to Shayla's arrival hence the low temp at first. Changing the temperature is as easy as pushing a button on a control pad. I have no record of her calling for service for murky water: the number and instructions to do so are on the hot tub and in the check-in packet. My records indicate we drained and cleaned it (again) on the day Shayla departed. That can happen, but obviously is an indication that it was enjoyed well by her group of 16 people, as also indicated by the beer can in the filter area. Shayla booked the "economy departure clean" which has a short check list: return items to where found, turn down the thermostats, close the doors and windows, wipe up any spills, take all of the items you brought with you (there is a dumpster onsite for the trash) and leave the keys. Those that wish can ignore the items on the list for an upgrade of just $8 per person which Shayla declined. I've passed along her 'deep clean' concerns to the cleaning contractor and it is scheduled as part of our Fall seasonal clean. Perfect location, perfect setting, perfect amenities, perfect home, perfect stay! Hi Edwin...Thank you for sharing your beautiful home with us. It was a pleasure to meet you and we appreciated your welcoming hospitality and concern for our stay. We couldn’t have asked for a better fit for our family. Your place was amazing!! And absolutely perfect for our large family gathering with 11 adults and 9 children. To accommodate all of us we rented both the main house and the guest house. The 3 bedrooms on the main floor were clean and comfy with nice bedding and comfortable beds. The master bedroom was awesome; patio, jetted tub, fancy sink, fireplace, large closet and extra sleeping pads we used for the kids in the loft. We also enjoyed the disconnected studio room for our parents who needed a little bit more privacy. The kitchen we fully stocked with all the utinsiles and supplies we needed. The outdoor patio and hot tubs provided more fun and activities during our stay. The garage was large enough for all of our bikes and gear and other stuff. The children appreciated the toys that came with the house; balls, frisbees, games, puzzles and more. The grand piano was the cherry on top and our family talent show was complete because of it. We also appreciated being able to rent out the bunk house for a couple of extra rooms. It too was comfortable and perfect. Nice bedding, great small private kitchen and easy access. The stream in the backyard was fun to play in and throw rocks (next time we will bring our little tubes to float it and poles to fish with). We were happy that the biking path was just across the street and really enjoyed the location of the home. Close enough to town, but far enough away to feel removed from it all. We met the cleaning staff as well. They were professional and friendly and nice to visit with as we were checking out. Our visit to Sun Valley was perfect thanks to this beautiful home. We would recommend it to our friends and would certainly come back! Thanks again! Other Activities: Snowboarding, Snowmobiling, Wildlife Viewing. Minutes to Everything! We are 10 minutes to the south of the ski lifts and downtown area. The map on the advertising site is generated by the advertising site and doesn't accurately portray the exact location. Rates are subject to change until confirmed with a payment. In the upper right hand column of this ad, you can input your dates and receive a quote. Stays over 10 days: please contact the owner for a custom quote to have the correct charges emailed to you. Feel free to click the email the owner button with further questions or to find a special rate for your event. Multiple pets? Ask owner for correct pet fee quote. Rates are subject to change until confirmed. Service fees are per week. To review all of our policies including cancellation, click " book now" in at the top of this page. You can review the rental agreement links on the next page without making any obligation.